How do you transform ESADE Alumni into a brand that people can and want to emotionally connect with? By taking the brand experience to the next level, injecting warmth and humanity to the global identity. With a new visual style that is specifically designed to reflect this shift in positioning to a more human-focused brand where people come first. 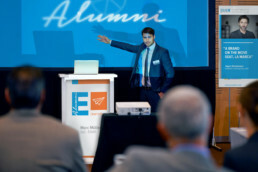 The idea is to infuse ESADE Alumni’s identity with the concept of unity and togetherness – while still maintaining a formal institutional structure. Keeping this in mind, we redesigned the brand’s logotype and graphic style to give it a handmade, organic touch – one that conveys the message of people connecting, creating and growing together.